The winter months in the Dallas, Fort Worth area is a roller coaster ride of sorts. The weather can change almost instantly from 80 degrees to below freezing over night. There are however a good number of days that weather will very nice to work outdoors. Your lawn may not be ready for mowing, but winter lawn seeding now will help your lawn get a head start spring growth. Dormant seeding is the practice of sowing grass in the winter months when grass seeds are inactive for growth. Seeding can be done during the months of November through February. Its is ideal to plant in February when there is no competing seeds or invasive plants trying to spread and the spring is right around the corner. 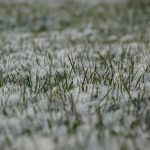 Seed your lawn before that final thaw, and follow these steps to ensure the grass will be green and lush. Rake or till soil before seeding. Remove debris in the area before seeding. Follow seed provider instructions for best spread seed coverage. Too much or too little seed is not beneficial. Lightly rake the surface to cover seeds. Keep off the lawn. Let the weather cycle of freezing and thawing in the coming weeks will help the seeds set. Do not use herbicides until after germination has set in. When spring arrives, mow your new winter lawn when the grass reaches normal mowing height. To maintain your lawn continue to see every six to eight weeks after seeding, for the rest of the season. 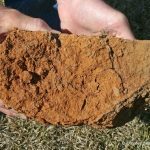 Why you should amend clay soil? It’s so hard for plants to thrive when their roots are planted in clay. How to amend clay soil so that it’s easier to dig, easier to water, and easier for your plants? Soil is the foundation of the garden. 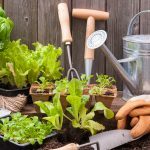 When you have a hard clay soil in your garden it makes it more difficult for your plants to grow and thrive. Aged manure… the list goes on. If you’re amending a large garden area all at once, figure on adding a layer of organic material that’s a good 3-4 inches deep. Use a rototiller if you have one, or use a spade and some sweat equity to mix it all together. If you can find a strong able-bodied teenager who wants to earn some cash, all the better. Spread the organic material out across the area to be worked, and use the spade to dig down, turn over, stir, chop, and repeat, until the entire bed has been worked. For a few months after amending your soil, pay a little extra attention to the soil moisture when watering your plants. The clay around your newly amended area can act like a bowl, holding too much water and staying too wet. Expanded Shale is porous, high-temperature fired clay that never breaks down and can hold 38% of its weight in water. It is highly recommended to use expanded shale for every planting! Its size helps produce air flow, which provides oxygen to the roots and improves water retention in sandy soils. How to use Expanded Shale? 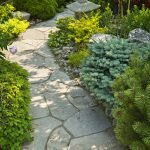 Gardens and landscapes that have clay soils will be tricky to plant the types of plants you want without some soil modification. If you have a large or small project help is just a click away with Lawn Care Flowermound. For Landscaping, Lawn Maintenance, and more Contact Us for a free estimate. These 5 common grass weeds in Texas can sprout up in your lawn as well as your gardens. While some grass weeds are easier to manage than others, therefore not solutions for these weeds will be the same and might take more time to treat. If you don’t see the weeds in your lawn you can your type of lawn weed here. Weeds can overtake a stressed lawn. A few simple steps can protect it. Watering deeply and infrequently helps your lawn compete by encouraging deeper root growth. 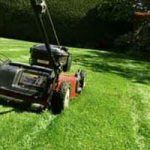 Set your lawn mower higher: Mowing at the proper height, usually one of the 2 highest setting on your mower, helps the grass grow thick to shade weed seeds, so it’s harder for them to grow. Feeding at regularly, like every 6-8 weeks during the growing season with helps your lawn thicken up and fill in bare spots, choking out weeds from your lawn is very effective. Applying a pre-emergent weed killer in the spring, as this prevent the weed seeds before they germinate. Crabgrass is common grass weed. There are many time tested remedies for fighting common grass weeds. It is your choice if you want to use chemicals, organic or alternative methods of weed control. Brands like Scotts Weed and Feed or Bayers 3 in 1 Lawn Feed is one method to use on existing weeds, however can be toxic for certain types of grass and the environment. Good old fashion weed pulling. Either by hand or with a weed tool, pulling weeds is very effective. For some weeds all you need to do is cover them up with news paper or special cloth materials that eliminates sunlight. they will die off because with no sun, no creating of nutrients through photosynthesis. 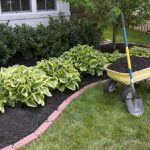 You can also apply mulch to flowerbeds after you pull the weeds. this will prevent the regrowth. Applying vinegar to weeds with help kill the weed and dry out its roots. Another method is using boiling water on weed that have taken up or grown in cracks in the your sidewalks or stone pathways. Even the best maintained lawns come under attack from common grass weeds. Weed seeds are in the wind, creeping weeds claim more territory, and weeds you thought you pulled quietly comeback. How well your lawn adjust with the weeds depends on the type of weeds involved, in addition to the response you choose for your lawn’s health. Understanding common lawn weeds and the options available to fight them can help you successfully combat the invasion. At Lawn Care Flower Mound, we strive in providing the best landscaping service possible. Call Now for a free custom quote or Estimate. These are mistakes to avoid. Many homeowners make the mistake of over-watering. Most lawns just need about an inch of a water per week. The best time of day to water the lawn (and usually any plant) is early morning so it has all day to dry. Sprinklers with automatic timers reduce water waste. your budget when you are in the nursery. Pruning too much or too little. done, you can do more harm than good. Every plant has a different pruning process. There are two ways that fertilizing can be a mistake. The first one is not doing it at all. The other is fertilizing too much or fertilizing improperly. the plant, over the period of a year, is going to have a nice time release of fertilizer. It’s a common myth that cutting the grass shorter means you have to mow it less. result in bare patches, which could make it inviting for insects and/or susceptible to disease. evaporate so fast. Cut shorter in the winter so that the sunlight can actually get into the soil. Need Expert Help? Contact us for a free estimate.